Cody’s Appliance Repair is factory service for all Gibson household appliances. We undergo continuous training to ensure we are experts on all Gibson appliance repair services. Our technicians work hard to ensure your Gibson appliance will work for many additional years of service. We are proficient with the full line of Gibson appliances. Contact us today for factory certified Gibson Repair. Our Gibson appliance repair technicians are drug and background screened for your protection and security. Plus, we keep our vehicles stocked with Gibson appliance repair parts to ensure that we are ready when you need us. Your appliance is in good hands with our Gibson Appliance Repair Specialists. Gibson was founded by Joshua Hall in Belding, Michigan, in 1877 as the Belding-Hall Company. Initially, the company sold cabinets that housed blocks of ice (ice-boxes). In the early 1900’s, the company was purchased by Frank Gibson, a competing manufacturer of “ice refrigerators.” It was the largest in its industry at the time. 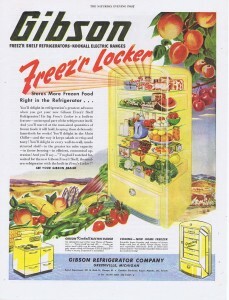 In 1932, the company began making electric refrigerators. It is currently owned by the Electrolux Corporation. If you life in Boise, Meridian, Eagle, Nampa, Caldwell, Kuna, Garden City, Middleton, Star, Emmett, or Horse Shoe Bend, give us a call today at (208) 938-1066 or (208) 375-1767, or you can request service right from our website. We are here to help!